In a world that's always changing, we can never stop learning how to keep it safe. Give your community or organization the tools it needs to help mitigate the impacts of a crisis or disaster with the NFPA 1600® and NFPA 3000™ (PS) Toolkit. Dangerous hazards, whether natural, human-caused, or technical, present complex challenges to building and life safety. 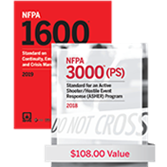 The NFPA 1600 and NFPA 3000™ (PS) Toolkit provides the standards and criteria to develop a comprehensive, multidisciplinary emergency preparedness program and establish and maintain crisis management capabilities. The NFPA 1600 and NFPA 3000™ (PS) Toolkit gives you the power to respond to any crisis or emergency with confidence and control. Take the lead in learning how to prepare your department and related organizations for the unexpected. Order the NFPA 1600 and NFPA 3000™ (PS) Toolkit to access expert insights and information critical to helping to protect your community.